I confess I see faces everywhere! Not some kind of paranoia but a tendency to just see inanimate things as having faces. ... it may appear at first glance to be a wholemeal wrap with a slice of ham and three olives, but it is without doubt the face of a sloth. or you can view it the other way up. Talking of sloths... look out in future posts for little sewn felt ones to hang in your Christmas tree. Here is my September Summary page. I saw the idea online to do a summary page where you add a sentence as and when, with an illustrated first letter of each sentence. At the end of the month, you have a page full of interesting happenings. If you decide to focus on the positives and leave out the bad stuff, you end up with a positive outlook to reflect on (which is better for the soul than letting the rubbish replay in your head- that happens without any encouragement or effort... positive takes effort!). At the rate I'm blogging, rather than actually crafting, I shall soon run out of things to show you. So if it all goes quiet for a while, you'll know why. Doing a little self- improvement course looking at how life is going and what is forming it: choice, habit or inertia? The answer can be all three. Been listening to a teaching CD with a couple of friends while colouring in Autumn colouring sheets and making notes in the gaps. A lovely chance to play with sparkly gel pens and reflect at the same time, then stick it in the bujo rather than lose it around the house. One of the suggestions is to make a non-judgemental list of the things you actually do in a day (including non things like vegging in front of the tv) and see if there is one thing you do by habit that you could swap for something you would really like to put in its place on purpose, until it has become the better habit. This was my first official page of keeping a Bujo. The theme was orange (not a fave colour of mine but definitely my husband's) because it seemed in keeping with the season. As you know, I love crafting, so keeping a craft list of things I made during the month was a good way of both remembering them and making sure I did enough of them to keep me sane: low craft = high stress levels! The odd (and useful) thing about Bujo lists is that, once I write them in something permanent, rather than a scrap piece of paper, they feel official and I feel more obliged to do them. So be careful what you write... or you might have to stick to it! My daughter talked me into this at the start of September and now I'm quite enjoying it. This was the first page I did and, when finished, showed it to my husband but neither of us noticed that I had written 2016 instead of 17. So had to stick a piece of card over it!!! Not a good start but I suppose it got me over the first hurdle of it having to be perfect! I looked up some ideas online and decided mine would contains lists (as I live and breathe lists anyway but lose them a lot), some arty doodling, a summary of the month and some thoughts about better things to come. Anything personal won't be online but general stuff and ideas might. 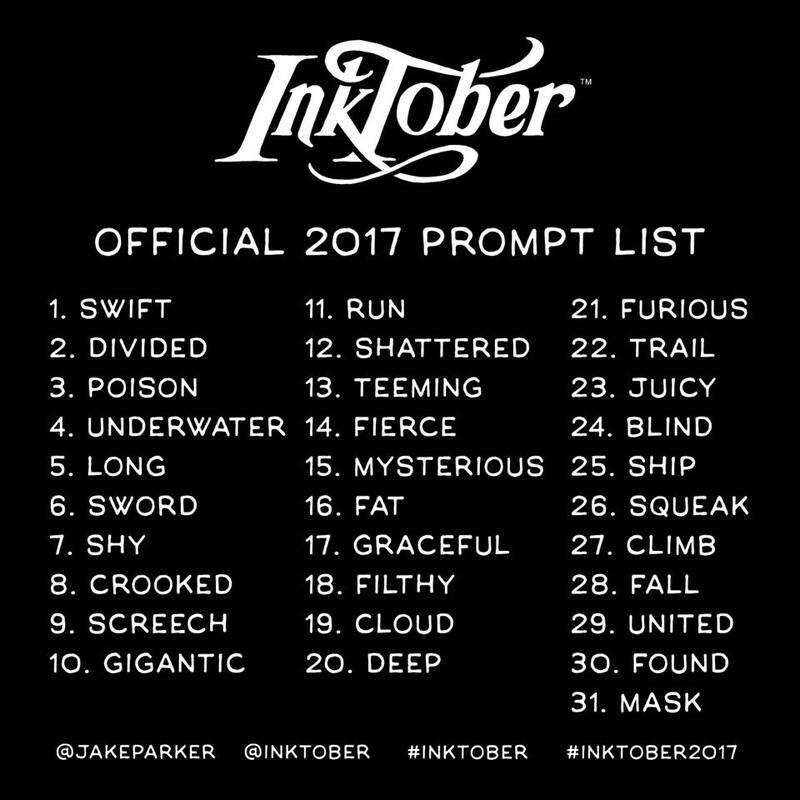 Actually, you've already see one of the pages cos I did the round up picture for Inktober in the Bujo (yesterday's post). Can you find everything on the list in the picture? And that is the end of Inktober for me! You can check out other people's stuff on Inktober Instagram, including husband Paul Kercal (the proper artist). Here is the cover for mu Inktober scribblings and then there are the last two in the series. We spend a long time at the beach searching for the perfect pebble: found! Next time, the composite picture I made using all the words from the Inktober challenge in one picture... a kind of hunt the word picture quiz. Two more after this then the finale picture, where I drew one combined 'hunt the words' picture as a farewell to Inktober for another year. The pillars will feature in the finale picture but many of the other pictures will be different... and mice related! I have a wooden model ship that looks rather like this- unlikely shape for successful sailing but the stuff of dreams and imagination nonetheless! Monarch of Cheese (did you notice the crown?). The word looks really odd when you read it the wrong way. We are on the home straight now and heading for a gallop! Today's three are trail, juicy and blind. And I typed blind into a search engine to get some ideas beyond the obvious and came up with a advertisers' paradise of window blinds! Here we are again, happily Inktobering. Today its cloud, deep and furious: sounds like a character study in an English lesson! If you can see odd shadowy marks on the paper, it is only because the paper is not quite thick enough so the next day's image shows through. These two mousy ones started an idea off in my head and, along with the daily Inktober pics, I started a single picture with all the list elements in it. So that will be coming up on a blog at the end of the single daily ones, as a kind of quiz page. Just a pile of dots, I admit, but that's only because there were so many of them teeming that it was impossible to draw them all! This a new mum surrounded by advice and criticism but fierce in her loyalty to and desire to do the best for her new baby. Is it a bird? Is it plane? Don't know... its mysterious! Next time, guess what? ... 13 14 15 of course!